I realized I didn't have any pizza recipes on my blog? Crazy, because I love pizza. So, here is one of my favorites. I have been searching for the perfect pizza dough recipe for a while now. I have tried quite a few recipes and have never found the perfect one. They either have a weird texture, take too long to make, taste too much like flour or don't have much flavor at all. Well, I am excited to announce that I have finally created one that I LOVE! It is so easy to make and it doesn't have any oil in it, which means less calories! I love it when you can cut calories and still have amazing flavor! What calories we take away in the crust, we can just make up for them in the cheese!!! 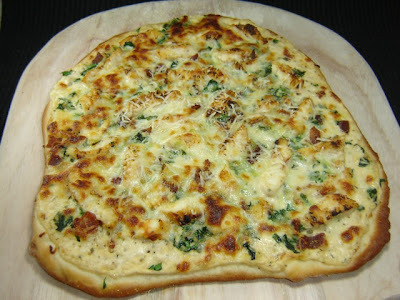 I topped my pizza with yummy alfredo, spinach, bacon, chicken and cheese and cooked it on my pizza stone (you must invest in one of these if you don't have one) and it turned out so good and I can't wait until I can eat it again! Dissolve yeast in the water; add the sugar and let set for 5 minutes. Make sure it is frothy and bubbly or start over. In the bowl of a stand mixer, combine both flours and salt. Add yeast mixture and mix for 4 minutes using the dough hook. Dough will pull away from the sides of the bowl and stay in a ball while kneading. If it is sticking to the sides of the bowl, add a little flour at a time, until it no longer sticks. Or, if it is too dry, add a little water. Place in a greased bowl and let rise until doubled (about 45 minutes). Roll out onto a lightly floured surface and place on a greased baking sheet (or pizza peel if using a pizza stone). Top with desired toppings and bake until crust is crispy and cheese is bubbly, about 15 minutes. Preheat oven to 425 degrees (or preheat pizza stone in a 500 degree oven). Roll out dough to desired size and thickness. Place dough on lightly greased baking sheet (or a pizza peel coated with a little cornmeal if you are using a pizza stone). Brush lightly with olive oil and sprinkle with Italian seasoning and a little garlic powder. Spread Alfredo sauce evenly over pizza dough. 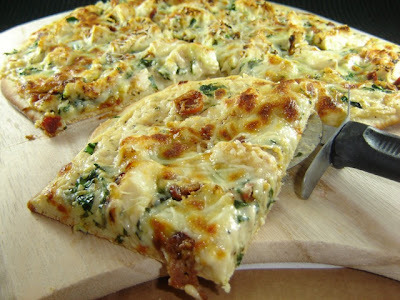 Top with chopped spinach, chicken strips and crumbled bacon. Sprinkle cheese over entire pizza. 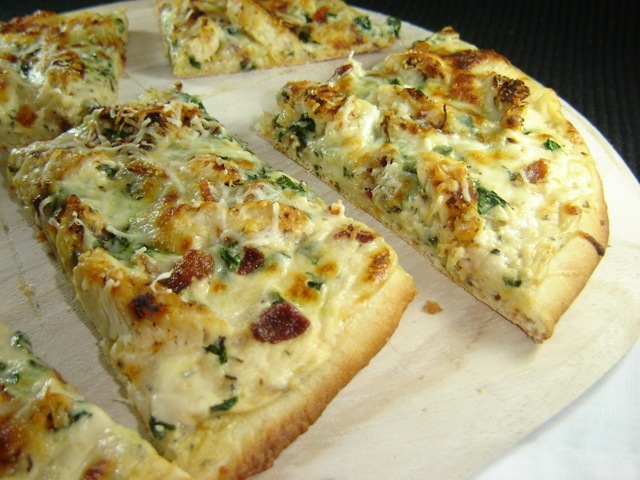 Bake for 15-20 minutes or until crust is brown and crisp and cheese is melted and bubbly. Broil for a few minutes if you want to brown your cheese. Well, the bacon just sealed the deal for me! Thank you for the wonderful recipe! I tried with whole wheat flour in place of all purpose flour, and it turned out great! I've been making the following pizza crust recipe for a while now and it's practically fool-proof. It only has to sit 10 minutes too so it's quick quick quick. It only has 2 1/2 cups of flour. Just thought I'd share it with you in case you wanted to give it a try. I made your pizza tonight! DELICIOUS!!!! Thank you for sharing!! Jenn what is a pizza peel?